I’m normally swayed by social analyses that stress the complexity of social processes. You may expect quite a few posts to come on that perspective. But recently I read a book called The spirit Level, why Equality is Better for Everyone that utterly persuaded me of a a simple straight forward relationship between one macro variable and an lot of what all of us think pretty important in personal and social life. The authors have started a Foundation, the Equality Trust, to share their research, engage with their critics, and try and influence public debate and policy making. It’s one of the best sites I know, extremely content rich with many downloads, data and analyses, and the book it is all based on is one of the best books on quantitative analysis I’ve ever read. There is an unbelievable serious effort to explain, explore and address any possible question, reservation, or criticism anyone might have of the data, the analysis and the conclusions. And it’s done in an ongoing way. Data, analysis, and engagement with critics is updated as they become available. It’s social science that makes me proud. And the message is important, what do I say, it’s IMPORTANT. The site has a short summary of the core evidence presented in the book and I copy that here in the hope that you’ll check it out. 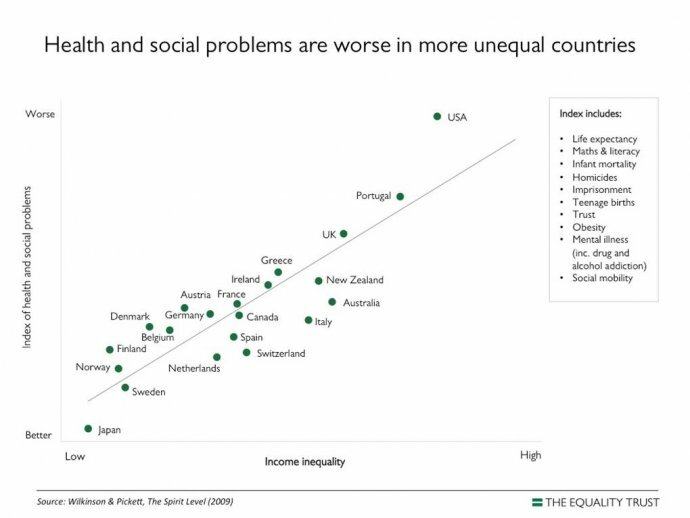 4) It’s not just people in poorer communities who would do better. The evidence suggests people all the way up would benefit, although it’s true that the poorest would gain the most. One element that is not emphasized much in the authors’ work itself, but which struck me as a very important addition to what seems to be a growing awareness within some US circles that inequality is getting totally out of hand: the extreme outlying position of the US, the wealthiest, most powerful country in the world. The comparative picture is very sobering indeed, pretty much incomprehensible to a Northwest European, but given the source of most of our ideological changes, all the more scary. This entry was posted in society and tagged Inequality, OECD countries, Richard Wilkinson, The spirit level. Bookmark the permalink.